On Getting Ramen (and a Hangover) in Japan | This Japanese Life. I stocked up on $.30 vegetarian packages of the stuff just for the sake of the noodles. They remained in that box, tucked into a closet (no door, but hanging wall tapestry, you bet) in my dorm room, eaten only when I was desperate. Coming to Japan, that ramen stigma lingered: It was the perfect food for people prone to late nights full of excessive drinking, the college undergraduate. It took almost a year in Japan and the complete abandonment of any vegetarian principles before I realized my error, or, rather, my accuracy. In Japan, ramen is the perfect food for people prone to late nights full of excessive drinking, that is, Japanese professionals out on the weekends. Ramen in Fukuoka is famous across Japan, and when you come to this city you’ll periodically smell a gymnasium full of sweat-sopped socks. The smell of Hakata ramen is distinctive and overpowering. Pork sweat has a lot of the same ingredients as the broth, with its blend of pork bones, fat and collagen liquefied into a cream-textured soup of pure disgusting deliciousness. I tend to soak the noodles in the broth, get a refill (a Fukuoka tradition of 100-yen noodle refills called kaedama) and then ignore whatever greasy concoction lurks at the bottom of the bowl. Hakata ramen is not instant ramen. It’s a soupier version of gravy. Hakata ramen is noodle poutine, and a perfect drinking food. You have to be slightly inebriated to want to eat it. The stands know this, as the two rival ramen shops are open until the wee hours of the morning, waiting for the city’s intoxicated masses with open doors. There are two rivals for the best Ramen in Fukuoka and arguably, the world. The first is Ippudo. The second is Ichiran. And while you might say it’s unintentional, I argue that they each cater to two specific kinds of late-night drinking consequences. I’m an Ippudo man. For drunken ramen consumption at 3 a.m., Ippudo is social, forcing late-night mixing by seating strangers together at enormous tables. You order what you want, a guy brings it to you and you eat it. You can cater the ramen to your tastes from the menu and/or add seasonings from the table. The broth is creamy and the stench isn’t overpowering. It’s delicious, and fills your bones with a kind of warm, steamy sense of delight. Ichiran, however, is ideal for nights you’d rather not remember. If you are hanging your head in shame, Ichiran is the place to go. There’s no need to interact with anyone. You come in, hit buttons on a machine, pay the machine and collect meal tickets. You are isolated in a cubicle. Instead of talking to a waiter, you fill out a survey card explaining the way you want your bowl served. With a ‘curtain’ and a ‘dividing board’, each seat is divided into a semi-private room, where you can focus on the flavors of your ramen without having to worry about anything that’s happening around you. The staff take your tickets and the survey form through a tiny waist-high window. You never see their faces. When the soup comes through the window, it comes from the mysterious disembodied hands of the ramen monks. They even have a printed guide to the difficult task of peeling a hard-boiled egg, so that you don’t have to ask someone to do it for you. (The eggs, by the way, are delicious). For sober dining, it’s wonderful. The bowls are lovely, rectangular and elegant containers for your spicy, garlicky ramen. The isolation lets you give the soup the full dedicated mind of a zen archer. As the Ichiran Web site points out, this is great for female patrons who don’t want to get harassed by drunk men. Ramen is the best food to eat when drunk and the worst food for the next day’s hangover. While you’re in the midst of drinking, ramen lets your brain shift its attention to fats and proteins, distracting you from the bubbling, hoppy mess of Asahi or Kirin beers swishing around in your stomach. Two pints of beer is enough to unravel your brain’s sense of appetite control. Scientists have proven as much – food looks better when you’re drunk, your appetite is unbound, and the only thing open is a ramen shop. So guess what? 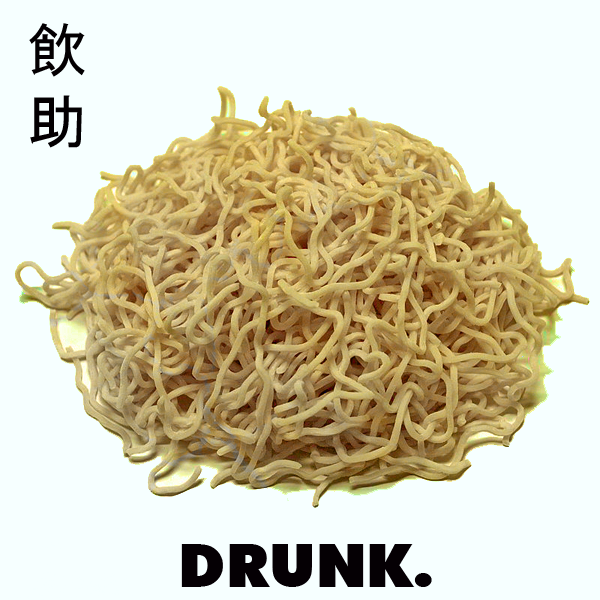 You eat ramen, and then ramen is psychologically bonded to the alcohol like a baby duck looking at its mom. So the next time you drink, you’ll crave the same thing – a high-calorie blend of fatty salts. The downside is that your appetite is not the only thing your body is losing control over. You get to urinate more – oh, the romance! – not because beer is any more “liquid” than water, but because you just can’t hold it the way you would when you are sober. So you quickly become dehydrated, which adds to the headache and general unpleasantness of a hangover. The salt from ramen doesn’t help. No one really knows why people crave the worst foods we could eat when we’re drunk. Most likely, bodies get confused while trying to pump a literal poison out of your system. The body needs energy to fight the toxic brew. Fat and sugars are the fastest way to get energy into your body in the short-term, but we end up spending that energy on late-night karaoke binges. Japan sells a hangover cure in the konbinis and supermarkets. I’ve used one, the gold-aluminum can of “Ukon No Chikara,” which is a ginger-and-tumeric-based energy drink. Guzzle one before your first pint (or classy, elegant class of wine) and you can consume to mild levels of excess without fear of retribution. It tastes like a candy necklace. A night of drinking with Ukon in your stomach certainly takes the edge off – Time Out Tokyo says that tumeric increases the stomach’s bile production, which reduces alcohol absorption. I was fine the next morning, and I also felt less drunk than I’d expect the night of. I like to think this is how the ramen monks at Ichiran cook your order, but Ichiran ramen looks infinitely better. If you’re an embarrassed misanthrope, you might like This Japanese Life on Facebook. This entry was posted in Food, Fukuoka, Fun and tagged hangover cures, japan, japanese food, ramen. Bookmark the permalink. i’ve decided i prefer the taste of ichiran ramen but totally agree that the atmosphere at ippudo is better. and the sliced pork! oh no, i’m torn! + I hope you noted the extremely absurd Rube Goldberg Ramen contraption in the video at the end there? I’m glad to have a fellow blogger looking at the outside-of-Tokyo perspective on Japan! Pshaw… plenty of good stuff on the island of Kyushu (just maybe more in real life, and less in the blogosphere). You just aren’t looking hard enough. Plus, I think there is a certain temptation to associate all foreign awesomness with Tokyo, since that’s where most of the English speaking NJ live. Ramen at 3am is the best meal ever. ramen and ukon doesnt do anything for hangover! u just believe it. in reality it does nothing. As for me, I eat Nissin Bowl Noodles Hot & Spicy beef flavor at 3am. I can’t decide if I like Ichiran or Ippudo better – they’re both so damn good! I like the privacy novelty of Ichiran, though some people say the concept is so strange. I also love the mini gyoza they have at Ippudo, and the thickness of the soup is just perfect. Okay, maybe I like Ippudo more. Best video I have seen for a long time – and now I want ramen!